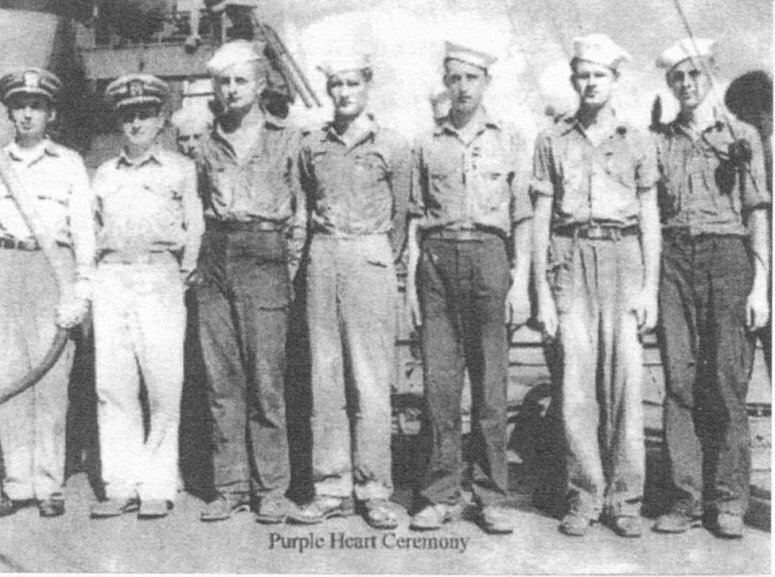 101k Aboard LCI(L)-821 Seaman First Class Johnny Risch (fourth from the left) stands between his mates on number three gun, Buddy Nokes and Earl Tennermann to receive Purple Heart medals at a ceremony aboard LCI(L)-821, 4 August 1945. These men were wounded in action on 7 May 1945 at Palau Islands while defending one of the picket lines against infiltration by the Japanese. LCI(L)-821 20mm guns were outranged by the enemy's field artillery, mortars, and 6-inch batteries. The LCI(L)-821 lost her Executive Officer and a number of men, and several were wounded.